Holi hai! One of the most colourful and widely-celebrated festivals of India is here! 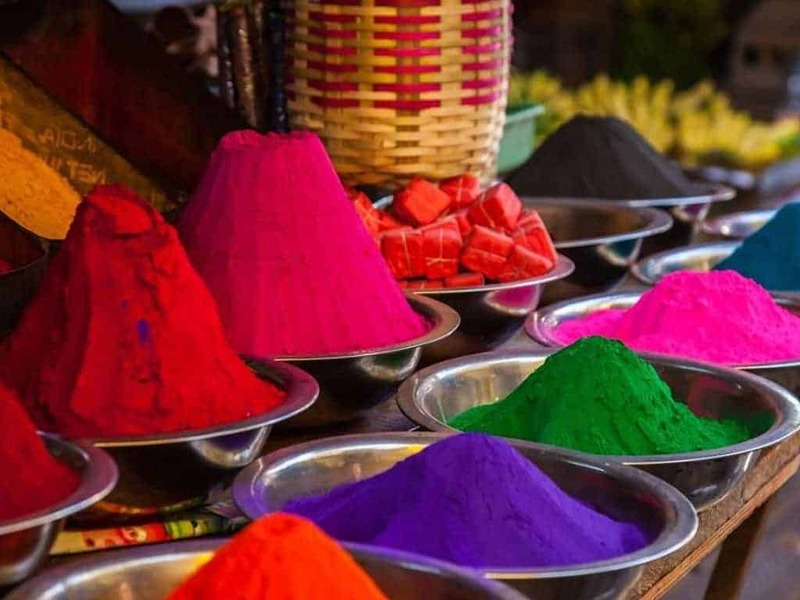 Vandana Natu, who has travelled and lived all over the country brings you her memories of Holi celebrations in the North, South, East and West of India. Beautiful pictures accompany this story to make it a visual treat. Spring is here. So is Holi, the Indian festival of colours, which falls on the full moon day of Phalgun, the last month of the Hindu lunar calendar. Shades of pink gulaal, crimson abir, and canary yellow powder take over our imagination. The magnitude of this festival has changed over the years but it is still the most unabashed of them all. Saying ‘Bura na mano, Holi Hai’ (please don’t mind, it is Holi) as you apply a dash of colour to someone, can turn strangers into friends. Forgiving past bitterness and moving on with a heart full of hope, still remains its essence. I have traveled across India. Called many states ‘home’ at different points in time–flamboyant Punjab, leisurely, languid Goa, Bengal, suspended in time, elegant Lucknow, dignified Karnataka, melting-pot Mumbai and the capital city of saddi Delhi. 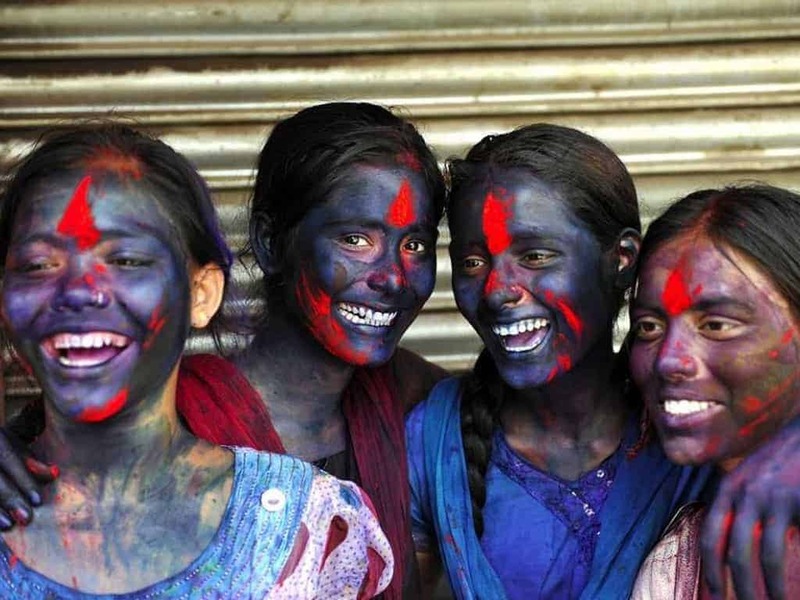 Read on for how we celebrated Holi across India. The granary of India celebrates this post-harvest festival in great style. One of the key attractions here is the Hola Mahalla, observed a day after Holi in Anandpur Sahib. An elaborate display of martial arts and skills by the warrior Nihang Sikhs along with creative contests at other places, grace this, one of the largest gatherings of Sikhs in the world. We were in Ferozepur, an Indo-Pak border town, in late 1970s. Those are my first memories of Holi. I was four or five years old. Its cultural significance never dawned upon me; I was more interested in Holika-Dahan, the evening before Holi. Symbolic burning of Holika who sat on a pyre with Prahlad, a child devotee of Lord Vishnu as mentioned in mythological stories. We would set out in groups to collect wood and twigs for the big bonfire to be lit at mid-night. The bigger our contribution, the more chocolates and sweets we got. To see it burn till the last cinders was of utmost importance because we would then run to the neighbouring localities to see if theirs had lasted longer. The competition was fierce. The next day was Holi. Young children were not encouraged to play with colours or get wet. We would be indoors and would join everyone over lunch. Chhole bhature and lassi was the menu. We were lucky if there were some puddles we could jump around in. I was in my preteens. The early eighties are best remembered for the most forgettable fashion sense. To pick a dress to wear on Holi out of this stack was easy. We lived in two worlds. There was our world and then there were the civilians which meant anyone who was not from the armed forces. 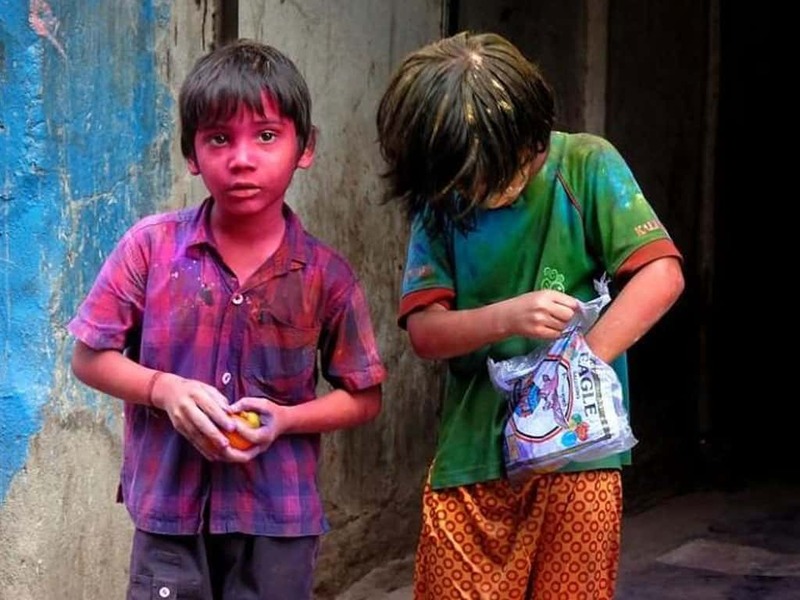 Holi wasn’t such a big thing for them. Goans celebrated their own version of the month long spring festival. It is called Shigmo. Dance performances at temples and community fairs were the order of the day. Very few played with colours. So we kept to ourselves. Got up early in the morning. Went to each and every neighbour’s house. Rang the doorbell till someone shouted at us or ambushed us from behind. Entering anyone’s house with colours was an absolute no! So we would wait near the door for all family members to come out. Then there would be chaos. Water balloons, gulaal and pichhkaris made of metal were unleashed with reckless abandonment. 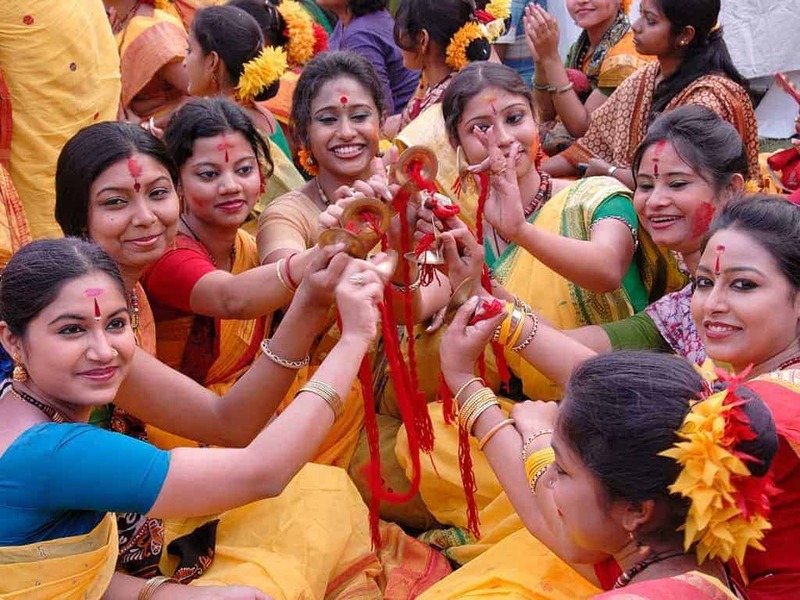 Holi is celebrated as Dol Purnima in Bengal. Rabindra sangeet, prayer offerings to Lord Krishna and spring swings can be seen all around. Basant Utsav, a tradition started from Shantiniketan, is celebrated to welcome the new season. Women wear beautiful yellow or green sarees and apply colour to each other gracefully. Quite unlike the rest of India where people wear old clothes to play Holi. We lived in small colonies in a jungle with nothing but a school, a shopping complex and a hospital around. Almost 20 kilometers away from Siliguri, cut off from everyone. Our preparations for Holi began well in advance, sometimes months ahead when we went out of town. The end of the eighties brought with it the demise of natural colours and water balloons. We would bring back synthetic colours, mica-studded glitter, fancy plastic water guns, spray pumps and even dyes. We acquired the skills to evade coal-tar, boot-polish, paint emulsion and chewing-gum attacks and discovered something new–the well-shaken Beer-pichhkari. And so we entered the era of playing Dirty-Holi. If there is any state that I would suggest you visit at the time of Holi, it is Uttar Pradesh. 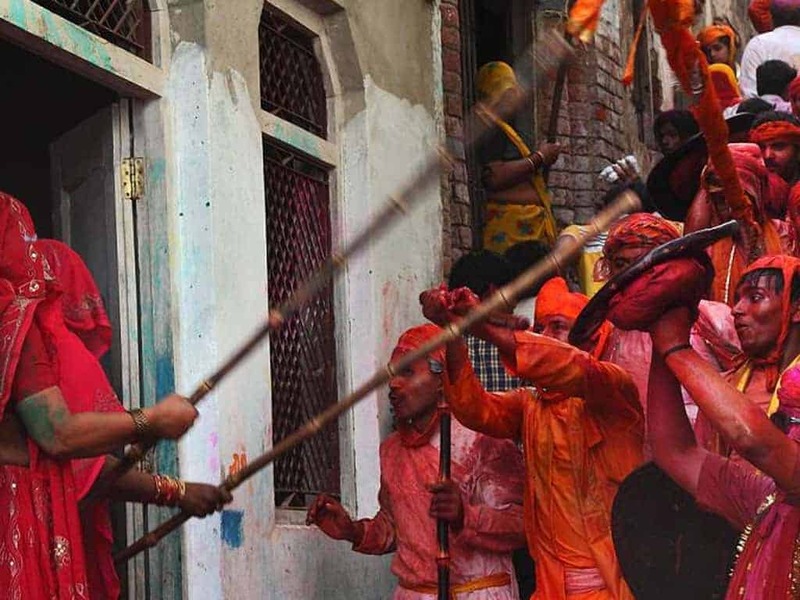 May it be the classical Mathura-Vrindavan style which takes pride in being the birthplace of Lord Krishna or the headstrong Barsana style where women charge at men with batons in mock anger to play the Lath-MaarHoli. There is an element of amourous teasing all around. I was in Lucknow, the city of nazakat (refined taste), in the early nineties. My college friends’ mothers would lay a table with malpuas, sewai kheer, matharis, gujias and cool sherbets. A cultured speck of colour on our cheeks and a kind invitation to relish the delicious savories awaited us wherever we went in a group (toli). Bollywood imagery came alive in Lucknow, as people came out to play Holi in pure white and pastel chikan and organza achkans and salwar kameezes. We were old enough to be let in on the secret of thandai: Holi’s mascot drink laced with bhang (cannabis). With a sizable Muslim population here, walking up to a stranger to hug them and wish ‘Holi-mubarak’ is perfectly normal. Something I will never forget about Lucknow is when a friend and I were returning from a daylong holi celebration. We saw a man in a kurta pyjama, walking alone. We came to an instant halt. We said hello and told him that we were his fans. He was Sir Mark Tully! South India celebrates Holi differently. It is observed as a simple joyous day without much uproar. 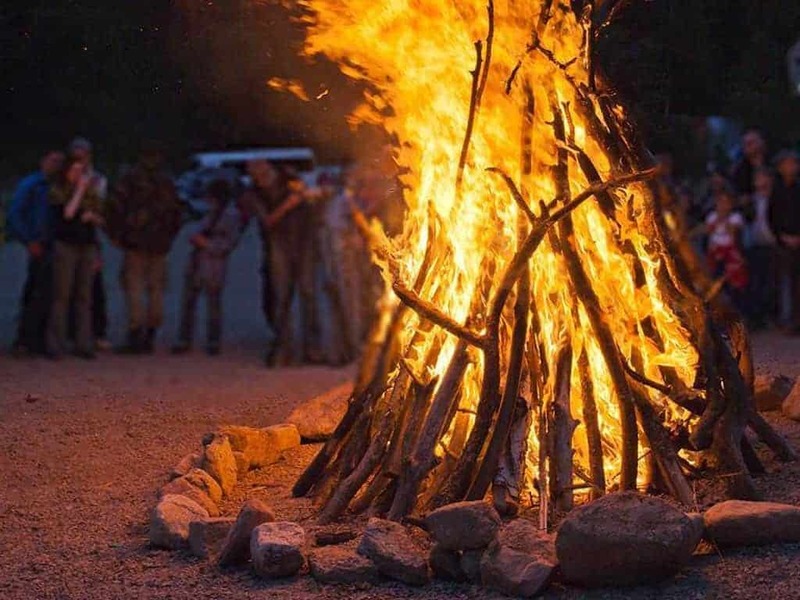 Holika-Dahan is called ‘Kaamadahana’, a public bonfire which signifies the victory of yogic bliss over lust. It is said that the Gods tried to invoke a desire for female companionship in Lord Shiva by sending Kama, Lord of Passion, as a cupid. Shiva burnt him to cinders for disturbing his meditation. Love can never be forced. Maharashtra exerts a strong influence on Hubli, which I belong to. Keeping with this influence, puranpoli, a traditional Maharashtrian dessert is prepared on Holi, the last festival of the Hindu calendar year before gudi padwa (New Year). 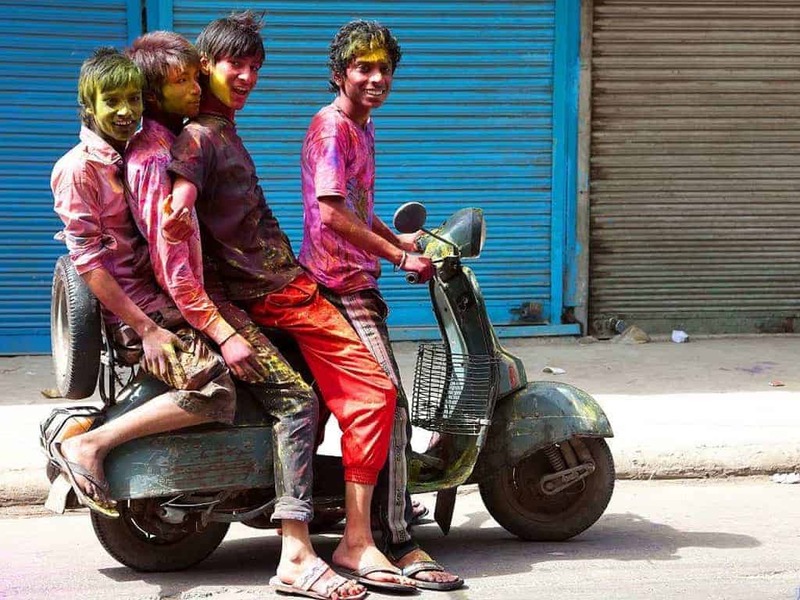 People play with colours on the fifth day after holi. It is called Rang-Panchami. Subtle and subdued, it is the gentlemen’s version of Holi. Mumbai is a melting pot of many cultures. Young children position themselves on rooftops with buckets full of water-balloons to be thrown on unsuspecting passersby. Their last form of stress busting revelry before the annual school exams begin. The sport of dahi-handi, making a human pyramid to break an earthen pot hanging at a height, is also played on a small scale. Friends come visiting with packets of sweets and gifts and film stars host holi-milan in their houses, and people are invited to join in and be part of the merry-making. I moved here in the late nineties for work. I lived in a leased apartment, so had to be careful about the interiors. Slowly as I settled in, I became carefree and started hosting Holi parties. Since my cats were popular with the children in the building, they soon became my partners in Holi crime. We would drag everyone from their homes, smear their faces with colour and ask those interested to join our gang in going to the next house. 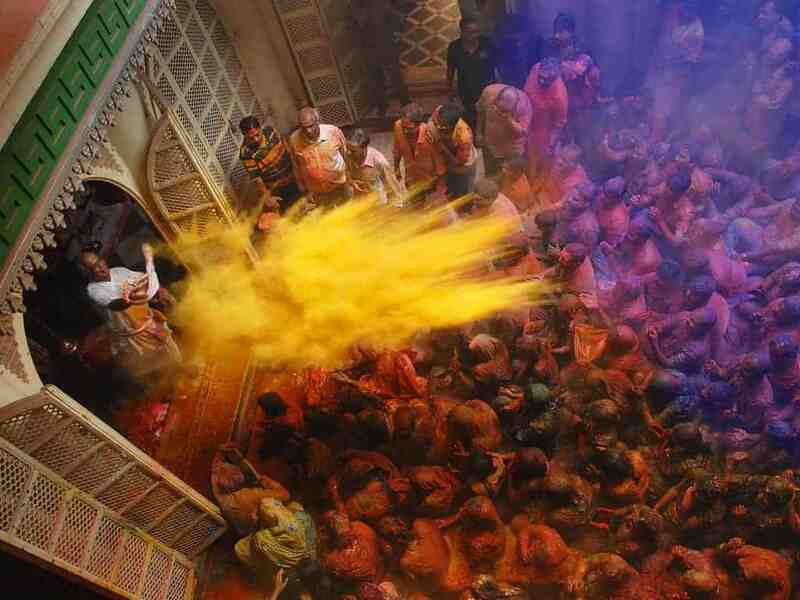 In years to come, our building became famous for having the most cohesive Holi celebrations. Everything happens with elan and great fanfare in the capital city of India. Nothing is subtle or subdued about the way Holi is played here. Spring is the most beautiful time to be in Delhi. There are flowers everywhere. A slight nip in the air and art lovers provide the perfect platform for many open air concerts, exhibitions and shows performed in various parks, haats and amphitheaters across Delhi. The celebration of new life and the new season begins a week or two before Holi in the form of cultural events. Ruins and forts come alive with light and sound extravaganzas. Shops are stocked with organic colours and gujjia sweets. It is not uncommon to see the usually quiet parts of Lutyens’ Delhi buzzing with enthusiasm as the politicians have an open-house for Holi Milan. I moved here after marriage, and live across the road from Nehru park. This place hosts amazing music performances of different genres all year long, and especially during festive celebrations like Holi. There are a lot of well maintained open spaces in Delhi where people play Holi. Any celebration without a pilgrimage trip to India Gate seems half baked. We make it a point to go there every Holi. Garden or terrace barbecue get-togethers are a norm. This year it is our turn to host one. You are welcome to join in. Holi Hai!